Mark Dodson’s food at The Mason’s Arms is complex, precise and highly assured – as would be expected from his twelve years working as head chef of Michel Roux’s Waterside Inn in Bray, where he secured their third Michelin star. 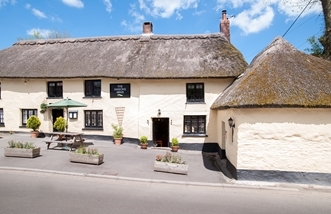 With elegant, but unfussy, menus that follow the rhythm of the Devon seasons, the country pub he runs with his wife Sarah was awarded a Michelin star in 2006 – within six months of opening – and has held it ever since. 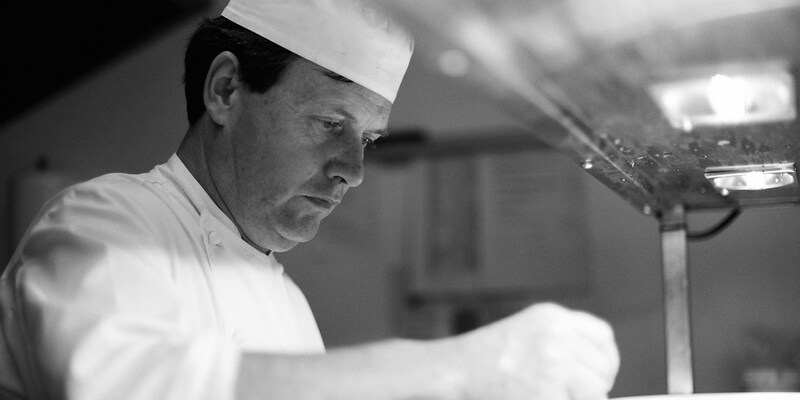 After leaving Bray, Mark Dodson spent three years working as Executive Chef at Cliveden House in Berkshire, before moving to Devon with his wife Sarah to open their own place, The Mason’s Arms – a village pub with fine dining restaurant attached. With his wife Sarah running front of house and Mark in the kitchen, the couple won a Michelin star only six months after opening, an award which has been held ever since. Mark Dodson serves British and French classics with a modern take, describing his food in understated fashion as “good food that is unfussy”. A master of classical French cuisine, his food is precise, mature and highly assured, with plates that display thoughtful complexity and effortless flair. The Roulade of pork belly with braised red cabbage and apple compôte is one of the most popular dishes on the menu, with locals insisting that it remains available in perpetuity. 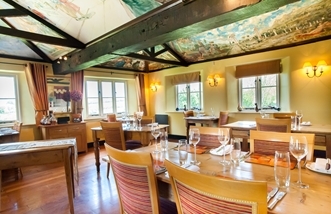 With a down-to-earth edge that you would expect from a country pub which caters for locals as well as destination diners, the menu is inclusive and spans from the sophisticated to the rustic. Highlights include the elegant starter of Scallops wrapped in prosciutto ham with butternut squash and watercress purée, followed by Wood pigeon with blueberry jus, beetroot purée and potato crisps and for afters, a comforting Chocolate fondant with peanut butter ice cream and dark chocolate sauce. The food at The Mason’s Arms follows the annual rhythms of rural Britain, with a separate game menu available when in season. The emphasis is on the very finest ingredients, with local Devon producers and farmers providing much of the restaurant’s supply. A champion of the South West’s remarkable bounty, Mark Dodson worked with two Michelin-starred Michael Caines of Gidleigh Park to launch the Exeter Festival of South West Food & Drink in 2014. Mark Dodson also runs a consultancy, focused on transmitting the knowledge he has gained over his many years at the top of his game. Drawing on his 35 years (and counting) of experience, he guides clients through the process of starting a new business, with advice ranging from management to marketing to menu design. His impressive impact on the UK fine dining scene is long set to continue. It seems like a new report appears at least once a week bemoaning the decline of the English pub, but Mark Dodson’s pub restaurant The Masons Arms has defied the trend.